This recipe makes a great side dish for Thanksgiving turkey. Add a tablespoon of olive oil and the sausage to a Dutch oven. Cook on low heat until the sausage is browned. Add the onion, the garlic, the crushed red pepper flakes, and a ½ teaspoon of sea salt to the pot. Continue to cook on medium heat while stirring frequently for three minutes. Add the chopped broccoli rabe. Cover and cook on medium heat for five minutes. In the meantime, preheat the oven to 350 degrees. Combine the breadcrumbs, the grated cheese, ¼ cup of olive oil, ¼ teaspoon of sea salt, and the black pepper in a mixing bowl. Mix well and set the mixture aside. Add the lemon juice to the broccoli rabe and sausage mixture. Stir the ingredients well. 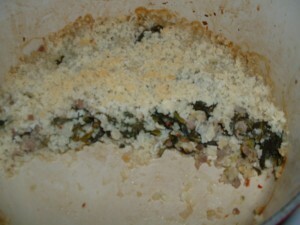 Spread the breadcrumbs out evenly on top of the broccoli rabe and sausage. Bake the casserole in the preheated oven uncovered for 40 minutes until the breadcrumbs have browned slightly. I finally made a veirson of this. I used what i had on hand so i ended up with green garlic, green onions and Tatsoi instead of the broccoli rabe. I also inadvertantly bought chicken sausage that was already cooked so I sauteed it up in pieces with the casing. Still this was a quick and delicious dinner! I’m having the leftovers for lunch.thanks for your inspiration Jen! Thank you. I am glad that you enjoyed it.